Phil Scott is right about an “affordability crisis.” He is dead wrong about the causes. | The Vermont Political Observer. Phil Scott is right about an “affordability crisis.” He is dead wrong about the causes. Our Lieutenant Governor is basing his gubernatorial campaign on “the affordability crisis,” the very real phenomenon that has more and more Vermonters pinching every penny and losing ground in areas like saving for retirement and college tuition. Of course, being a Republican, he defines “the affordability crisis” as a matter of burdensome taxation and enterprise-crushing government. Those may be contributing factors, but they’re not much more than cherries on our affordability sundae. The real, fundamental problem is wage stagnation for the middle and working classes. They’re getting the big squeeze from a financial system that’s benefiting the wealthy at everyone else’s expense. Tax pressures on working Americans are a relatively small factor in the affordability crisis. And Phil Scott’s agenda will do little to address the fundamental challenges we face. Some of his ideas would actually make things worse. … the gross state product as grown since 2010, with a slight dip in 2013. But the rewards of Vermont’s recovery concentrated at the top of the income scale, while everyone else lost ground. In the decade since 2004 median household income fell from $58,328 inflation-adjusted dollars to $54,166. And it would be impossible for Phil Scott or anyone else to cut taxes enough to make up for that. The lag in middle- and working-class income has several effects. 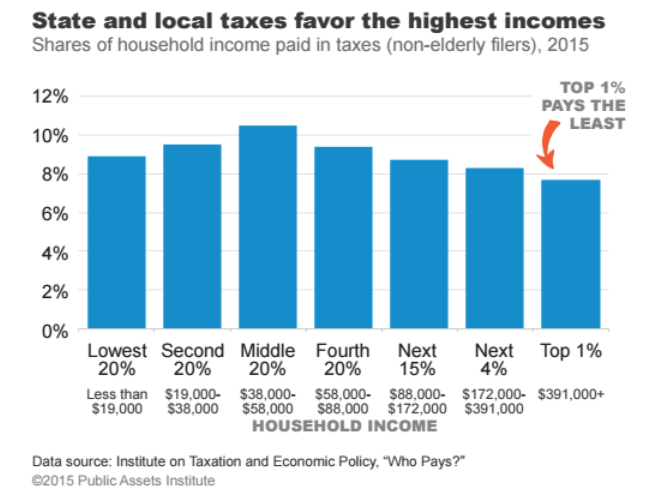 First, total state and local tax receipts are lower because our tax system comes down most heavily on the middle. 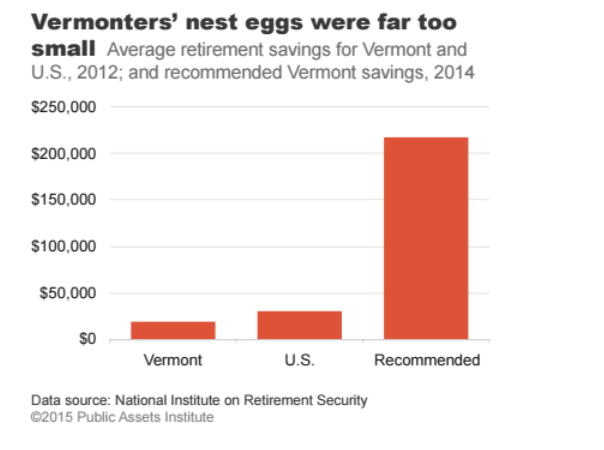 Third, more and more working Vermonters need public assistance to make ends meet. Programs like Medicaid and food stamps were originally intended as social safety nets for those down on their luck or between jobs. Now, a lot of jobs don’t pay a living wage, and those workers end up taking some form of government assistance. Which is a major driver in the rising cost of government. 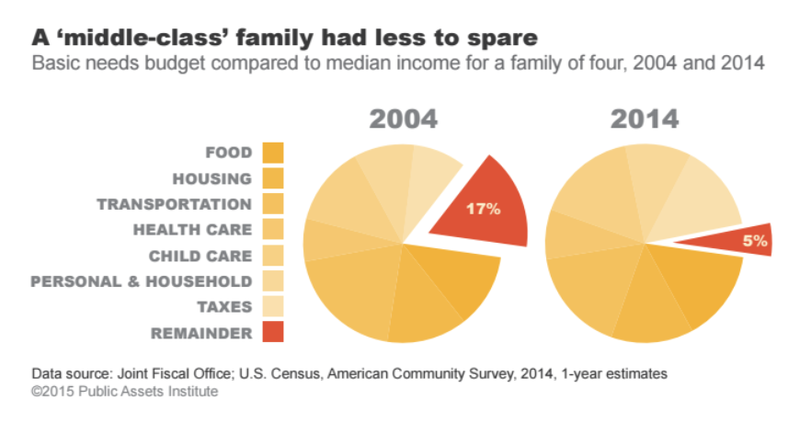 In 2004, a middle class family had a comfortable cushion against bad times, and opportunity to save for future needs. Now, that cushion is almost gone. There is more in this report, much more. It chronicles rising poverty rates, homelessness, and dependence on food stamps. It reports a horrible situation for single mothers of small children; more than half are living in poverty. And they are our future. That’s more than enough from me; you can read the rest yourself. Highly recommended. Vermont needs to resist the siren song of our great national race to the bottom. We need to find ways to create a fairer and more productive economy. Which, from the evidence provided here, are really the same thing. It’s not a choice between fairness and productivity; they are two sides of the same coin. This entry was posted in Economy, human services, Labor, Phil Scott and tagged affordability crisis, food stamps, Public Assets Institute, social services, State of Working Vermont 2015 on January 10, 2016 by John S. Walters. A person I respect for his broad knowledge of budget issues said today that the state spends nearly 3 times as much on Corrections as on Education. His point was that this ratio should be flipped in a rational budget (including treating addiction as a disease rather than a crime). Not likely to happen this legislative session, and certainly not under a Phil Scott governorship. For that matter, not likely if either Democratic candidate (Matt Dunn or Sue Minter) wins, although either of them would be more likely to tinker around the edges. In his recent interview with Mark Johnson, Pro Tem John Campbell argued against reducing incarceration. So there’s another centrist Democratic doorstop firmly in place. Where what small shreds of an American Left that still remains have been kettled, so they may die quietly. We are the 7th most expensive state to live in. We need to downsize our government to reflect the number of residents. Living in one of the many small Vermont towns we see an increase each year of our property taxes to help cover our school costs. Our town works hard to keep their costs under control but after that we lose control when it comes to school cost. Consolidating schools and supervisory unions is an extremely slow process and while it is happening we as property owners are struggling to pay our taxes. Well, Susan, let’s talk about the richest Vermonters, shall we?– who have collectively garnered to themselves an additional 190 million dollars each and every year since the Bush tax cuts of 2004–left in place by that lion-hearted liberal Barack Obama–and who actually pay less in property, state and municipal taxes as a percentage of their income than, most likely, you, and, certainly, me. Why have our political leaders not seen fit to tap into this obvious basin of cash, you ask. To borrow a memorable phrase from a barely remembered ex-president, “They’re my base!” That seems true enough for the Democratic Party in Vermont’s government, and it must go doubly so for the Tory GOOPers… Fact–we’re certainly not hearing squeals of outrage at such rank favoritism from the Out Party. Speaking of parties—They’re having one, and we’re not in it. Thanks, brother Carlin, and I fondly imagine a cage match between you and The Yam. Go get ‘im, tiger!